Does this signal a new direction for Infor? 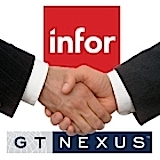 By now you have heard the news of the acquisition of GT Nexus by Infor. For a company of Infor’s size—though a fairly large company—this is still a really big deal at $675M. And for GT Nexus, who has lived at the heart of the multi-party logistics network for decades, being owned by an ERP company may be a big shift. With high profile bankers in the mix, it was just a matter of time until the right suitor came along. So what are the issues, implications and opportunities for both companies? Enterprises today are dominated by the organization of their supply chains. ERP, though an important market, does not support the trading partner commerce and supply chain models like so many companies today. They have multiple agreements, arrangements, outsourced or other models that make them more a value chain than a single enterprise. ERP was not architected for these 21st century business models. Networks are a hot topic these days. This acquisition—a working transportation and direct procurement platform—gives Infor a leg up against other ERPs who have business units with networks (SAP), while also putting them into competition within the Supply Chain Network sector. Conversely, Infor has thousands of consumer products companies—both manufacturers and brand retail leaders. GT Nexus also has some of the biggest international retailers. This Infor ‘Retail group,’ if they choose to manage Retail cross-functionally, will be a dominant retail solutions3 organization with more than 3,000 plus fashion retailers. GT Nexus will be managed, according to Phillips, as a dedicated business unit, but the synergies are obvious and will certainly be taken advantage of. GT Nexus has been the leader in Ocean transportation and in a very specialized area of logistics. Recently they have been working to broaden the solution to include ground/intermodal components. Infor has a world class WMS and also has been investing steadily in the transportation solution, but did not stand out as the leader in that space. This merger will surely change that positioning. It will be interesting to note how product plans will evolve in ground transportation between the two development teams. Networks are a unique manifestation in transportation, but have been evolving into platforms to manage the entire value chain of a company. (Read Supply Chain Renaissance). Firms like GT Nexus now include the trading partner integration from forecast, to procurement, to logistics and financial analytics—trade/supply chain finance. Unlike ERP, which is architected for one enterprise and one data model, supply chain networks are the many to many universe. Building such a network takes time and technology, but most importantly, a reputation as the destination point for your industry. In one scoop, Infor has bought into the biggest ocean transportation network and a growing direct procurement platform in the marketplace (around 25k global shippers and carriers). Charles Phillips and Duncan Angove, on a call with analysts, both clearly articulated the recognition of the ERP vs. the Supply Chain Network universe and are determined to see the network flourish. Infor plans to put more of their enterprise functionality into the network so that customers can leverage additional functions. 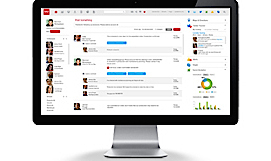 One area in which Infor has innovated is the enterprise social network with their Infor Ming.le. Blending Infor Ming.le into the GT Nexus network will enhance social collaboration between trading partners. Those very same mega companies most often have a large ERP, SAP or Oracle as their core enterprise system. Will GT/Infor be able to hang onto these most important customers? Many of these firms declare SAP as the enterprise and GT Nexus or JDA as their “ERP for their supply chains.” Without extremely delicate care with these customers, SAP would be able to introduce some significant FUD. Today, SAP is just getting their sea legs in TM (read more about SAP’s TM). But selling a ‘roadmap’ has been a strong suit of SAP. Another key factor is the way in which Infor is organized. Charles Phillips and his team have done a masterful job of re-organizing Infor, over the last few years, into a very centralized organization. 1 CTO, 1 CMO, and so on. ERP and global logistics—especially ocean—are very different worlds. Buyers are different, use cases are different, and technology is a bit different. (I say this in spite of press releases to the contrary.) How and who will manage in the future? Will Infor be able to maintain the spirit of the GT entrepreneurial vigor, the supply chain community spirit and the deep logistics industry community involvement while being housed in a large, mostly, ERP company? Another factor, as we mentioned above, is the network approach to transportation. We see this as an opportunity, but again, the management and community elements are quite different from ERP. SAP and Oracle have not done well with these network approaches to date, though SAP is investing heavily in changing that, which will be another threat to Infor as SAP learns and grows more. Having said that GT Nexus is so entrenched in the industry that, at this point, it would be exxxxxxxxxxxxxxxtremely difficult to unseat them. Though many TM players are working to put ocean TM in their solution, the reality is that it will be a long journey. And, if a well polished process is working, dislodging that and re-confronting the complexities involved in trading and using a complex system just does not look attractive.